From Donaghadee in Northern Ireland to Portpatrick in Scotland on the Mull of Galloway. The North Channel swim is approximately the same distance as the English Channel, but it has two major differences. The first is the sea temperature, which can be 3-5 degrees lower and the second is the hundreds of Lions Mane jellyfish which plague the Channel during the summer months and are for the most part unavoidable. 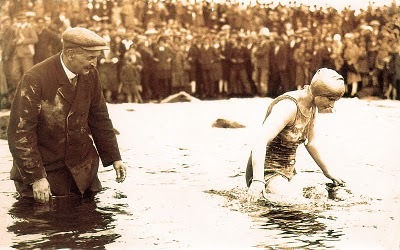 Although once regarded as an impossible swim, it did not deter a few brave and early pioneers, such as Mercedes Gleitz (right) who made several attempts, the first one in 1928. Although Mecedes never conquered the North Channel, she nevertheless went on to complete some truly outstanding swims in many parts of the world. She also spent a lot of her time and money doing great work for charity. During the 1930’s and of course WWII, there were no known swims in the Channel. It was not until 1947 that the Channel was first conquered by Englishman Tom Blower from Nottingham, with a time of 15 hours 26 minutes. Tom was well acquainted with the sea, having served in the Royal Navy during the war, and was awarded a medal for bravery, for diving off his ship to save the life of a fellow seaman. There were many attempts during the 1950’s and 1960’s by some well known names of the period, such as Jack McCleland (NI), Margaret Erridge (England) and Florence Chadwick (USA), and the ill fated and tragic death of Greek Army Major Jason Zirganos, who died shortly after being lifted from the water before he could finish the swim. 1970 saw the first successful solo swim for many years, when swimming legend Kevin Murphy (Left) from London reached the Scottish shore. Kevin went on to complete two more successful solo swims across the Channel, the only man to date to have done so. Success came to Ted Keenan from Enniskillen when he landed at the botttom of the Scottish cliffs after a gruelling 18 hours 27 minutes swim, making him a triple Channel swimmer. More brave attempts followed in the 1970’s and 1980’s, including Margaret Smith (Lincolnshire), Grainne Gunn (Bangor) and Sandra Blewitt (New Zealand) all of whom were unsuccessful, having to give up only 1-2 miles from shore. 1988 was an historic year when the first woman, swimming legend Alison Streeter from London, made a fast and successful crossing. Alison, like Kevin Murphy, went on to complete two more solo swims across the Channel, the only woman to date to do so. The very next day after Alison’s first swim, Margaret Kidd became the second woman to swim it, and the first Scot. The 1990’s saw more attempts, mostly unsuccessful. Perhaps the most heartbreaking was that of Paul Lewis from Dorset, who had to be lifted from the water just over 100m from land on the Antrim coast. Paul returned the following year and completed it. Another swim of merit was made by Dublin man Colm O’Neill in 2004 in a time of 11 hours 25 minutes. And in 2008, Colleen Blair (right) from Scotland was sucessful in reaching her home shore. In 2010 Ann Marie Ward from Donegal, after several attempts, completed an amazing endurance swim of just under 19 hours to reach Scotland. Likewise that year, Stephen Redmond from Cork made it across to become the first man to complete the 7 Oceans Challenge. And in 2013, American Michelle Macy completed a record swim to have the fastest overall time to date of 9 hours, 34 minutes, 39 seconds. Anna Carin Nordin from Sweden had success in 2013, and became the first woman to complete the 7 Oceans Challenge. Another fast swim was completed in 2014 when Coleen Mallon from Camlough finished in just under 10 hours. 2015 saw history made when Rohan More from India became the first person from his country, and the first Asian, to conquer the North Channel, in 12 hours 46 minutes. There were many more successful solo swims over the years, too many to mention in this short history, but all great feats of endurance and worthy of the highest praise. And not forgetting the swimmers who did not make it to shore, all gallant efforts also deserving the highest praise. Over the years, quite a number of relay swims have taken place from “Ireland One” team in 1990, to 2015 when the international team “Fast and Frozen” completed the first 2-way crossing in 29 hours 57 minutes. During the last 10-15 years, the number of people wanting to attempt the North Channel has increased greatly, and in any long distance open water challenge experienced pilots are top priority. Over the years a number of pilots have accompanied swimmers into the Channel, but the two long established and regular skippers are Mr. Brian Meharg from Bangor and Mr. Quentin Nelson from Donaghadee. Swimmers from England, Scotland, USA, Sweden, India, Australia, New Zealand and many parts of Europe have come to test themselves in the cold, choppy waters of the Channel. Some made it and some didn’t, but no doubt they will return to have another try. Good luck to them all, for I believe that the old “impossible swim” myth has long been dispelled.